Even though James Parrish had already developed Bethel Cemetery for passersby, family and friends, when he died, his wife, Eliza set aside a separate half-acre for a family burial ground. James died less than a year later, in 1853, and Eliza buried him at the new site. After her husband’s death, Eliza Record Parrish married Henry Parrish, her busband’s brother. They, six of their seven children and their descendants are buried in Parrish Family Cemetery. Information compiled by the late W. T. Cozby records that John and Silas Record and others who were hanged in 1869 were buried in the Bethel Cemetery. Curiously, however, grave markers for the two Records lie in the Parrish Family Cemetery. 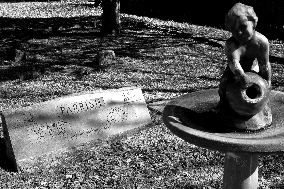 Today, the Parrish Family Cemetery sits in a neighborhood in the 700 block of Cardinal Lane, east of Moore Road. According to local residents, Coppell firemen have volunteered upkeep of the cemetery for a number of years. One of three cemeteries on Coppell’s east side, the Stringfellow-Moore Cemetery is nestled on a hill behind two large homes on Carter Circle off of Moore Road. Barely visible from the road, the small cemetery is accessed by an easement between the homes. The original entrance to this cemetery was from Bethel Road and had a gate on the Northeast corner. The land all around it was developed in 1972 and the entry was changed to the south side. According to records, the Stringfellow-Moore Cemetery was begun with the burial of the unnamed daughter of A. T. and A. J. Crow in 1882. Three other Crow children were subsequently buried there — all having died before the age of seven. At present, we have documented 28 graves at the Stringfellow-Moore Cemetery. As with the other Coppell historic cemeteries (and most cemeteries of that era), a good portion of those buried here were children. The Historic Bethel Cemetery is located in a small cul-de-sac off of S. Moore Road north of Carter Drive and is a public cemetery on land donated by James Parrish before his death in 1853. Originally known as Sands Cemetery, the name was changed to Bethel sometime before 1885. It is estimated that 200 to 300 people were buried in Bethel, but due to vandalism and deliberate destruction, there are only two markers left in the cemetery. The last known burial was in 1925 and in 1989, the cemetery was granted a Texas State Historical Marker. Five men and a boy who were victims of a lynching in 1869 are believed to be buried here. There are also several Confederate veterans and two former slaves. The Historic Bullock Cemetery is located about 100 yards northwest of the intersection of Denton Tap and Bethel School Roads. In 1855, Kentucky native, Washington Bullock, his wife, Caroline, and their 4 children moved here and in 1866, they purchased 280 acres near what has become Old Town Coppell. Here Bullock built the first brick home in Dallas County, operated a farm and served as Justice of the Peace. The Bullocks had other children and in 1869 created this cemetery upon the death of their youngest daughter, Julia Caroline. Today, the cemetery contains the burials of about 40 people buried between 1869 and 2002. Notable persons buried here are Washington Bullock, his wife, Caroline, several of their children as well as many in their extended family. Among those buried here are William T. Cozby, early Mayor of Coppell and Civil War Veteran, Burrell B. Howell.